Kathleen Ann Harper provides compassion, creative insights, and well-researched advice on how to take small steps toward big change, even in the midst of temper tantrums, diaper blow-outs, and the exhaustion, disappointment, and resentment that often accompanies parenthood. Within the pages of The Well-Crafted Mom, mothers find reassurance that they’re not alone, see themselves in familiar stories, and discover new ways to craft their beautiful lives. "Kathleen has a knack for gathering souls in the shelter of common stories, simple answers, and loving support — the things we mothers always need and yet so seldom ask for. I have been a grateful guest in Kathleen's home. Now, in this book, you can be her guest too. Invite yourself in to a well-crafted life." A shot in the arm of inspiration, Kathleen Ann Harper’s The Well-Crafted Mom will help you feel so much more capable of holding onto your soul in the midst of relentless day-to-day parenting. A spiritual tune-up, this practical guide and the craft projects that end each chapter provide calming antidotes to the stress that often accompanies motherhood. 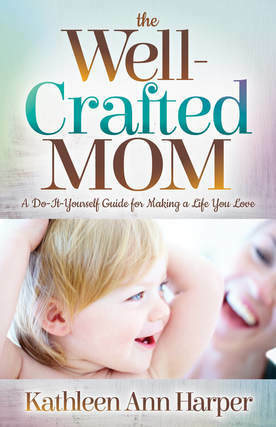 The Well-Crafted Mom is a beautiful resource for any mom. "Kathleen Ann Harper weaves poignant stories from her experience as a mother of young children into a book that will mesmerize and inspire you. The Well-Crafted Mom takes us beyond artfully written vignettes on the challenges of motherhood and reveals great ideas, practical tools, and easy mind shifts that can change a frenzied mom's life. The fun and meaningful craft projects at the end of every chapter are like balm for a stressed out spirit. This is a unique and powerful book every mother should read." "They say parenting doesn't come with an instruction manual. Well now, it does! The Well-Crafted Mom is an empowering guide to better parenting, explained by a true master of nurturing creative and vibrant families. Amidst a field of parenting experts, Kathleen Ann Harper shines." A part of every mother I know is in this book. I laughed and I cried like I would having an honest conversation with a with a good friend. Harper reminds us we are not alone on this journey of modern motherhood and, like a good friend does, Harper guides the reader through that tunnel to discover the light at the other end. Along the way are thoughtful soul-nourishing craft ideas that provide something often not found in western culture: ritual, as a symbolic marker for each transition. Written with exceptional honesty, and with each point so well cited, The Well-Crafted Mom weaves the past, present, and future of motherhood into an inspiring, encouraging, and hopeful path that every mother deserves. My second book is a collaboration between my husband, William Paul White, and me. The result is a beautiful blend of our very best skills: my writing, research, and storytelling abilities with Bill's ten plus years of inspiring thousands of families to sign with their babies and sharing his passion for baby sign language in interactive and fun workshops. • How to link signs into your everyday activities so you can discover why your baby is crying, whether it’s because something hurts, she’s hungry, or she wants her diaper changed. • Inspiration from stories from parents on how baby sign language eased mealtime battles because children could sign what they wanted to eat and when they were all done; built bridges in bilingual families; and created early signing conversations about what the child was fascinated by, like trains, balloons, dogs, and more. • An extensive photo dictionary of more than 100 American Sign Language (ASL) signs. 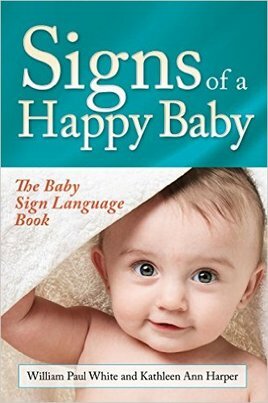 It’s super easy to learn baby sign language and we show you the way in our book, Signs of a Happy Baby. What your baby has to say will blow you away!